Researchers note the implications of "being a black lesbian woman on binge eating" have never been studied before. "Young adult lesbian women are twice as likely to be overweight and obese as their heterosexual peers and Black women are similarly more likely to be obese than White women," according to the grant. "Despite well documented disparities in binge eating, little is known about contributing factors in lesbian women, and in particular racial minorities." The researchers claim society can "influence young women's eating in everyday life" and hypothesize that racism and homophobia are having an impact on minority lesbians who binge eat. "Consistent with minority stress theories, preliminary data also suggest sexual minority stress—or the stress people from stigmatized groups are exposed to due to their marginalized social status—likely influences binge eating in lesbian women, but the role of unique minority experiences in binge eating has not been examined using EMA [mobile technology-based ecological momentary assessment]." The "minority stress theory" places the blame on "homophobic culture" and prejudice for sexual minorities who are in bad health. "Minority stress theory proposes that sexual minority health disparities can be explained in large part by stressors induced by a hostile, homophobic culture, which often results in a lifetime of harassment, maltreatment, discrimination, and victimization," the American Psychological Association explained in a newsletter in 2012. "Having multiple minority statuses increases the likelihood of experiencing homophobia, stigma, isolation and rejection, along with heightened risk for sexual risk behavior or substance use," the newsletter said. The new NIH study is looking at the "intersectionality" of lesbian women who are unable to control their eating. "Race, eating-related factors, and sexual minority-specific factors may also moderate daily associations, but have not been fully explored," the grant explains. "In particular, implications of having intersecting sexual- and racial-minority identities (i.e., being a Black lesbian woman) on binge eating have yet to be considered." This is not the first time federally funded researchers have studied lesbian obesity. 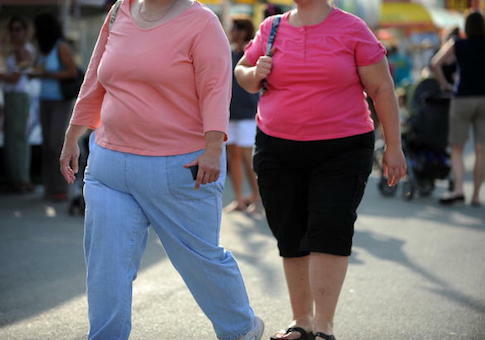 Taxpayers were previously billed over $3.5 million to find out why the majority of lesbians are obese and gay men are not. Findings of the five-year study included revelations that gay men have a "greater desire for toned muscles" than straight men. "Study aims include examining how daily affective, social, and health behavior factors impact lesbian women's eating, and how sexual minority-specific experiences uniquely contribute to binge eating in daily life," the grant states.